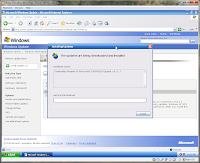 In my last post, I compared Windows VirtualPC to VMWare Player. 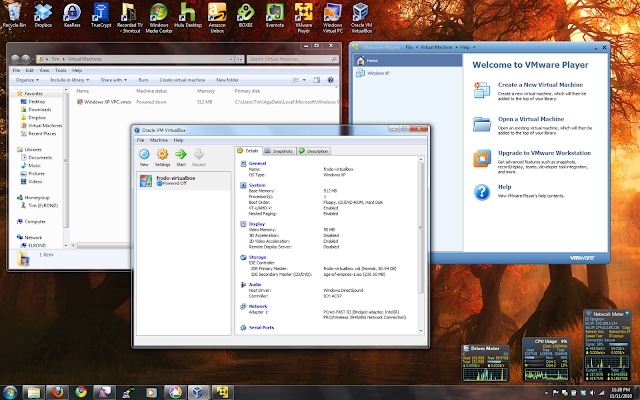 I thought I would also try out Oracle's VirtualBox to see how it stacks up against the other two. 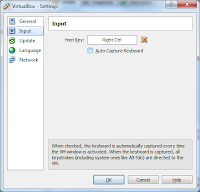 VirtualBox is in many ways very similar to VirtualPC. 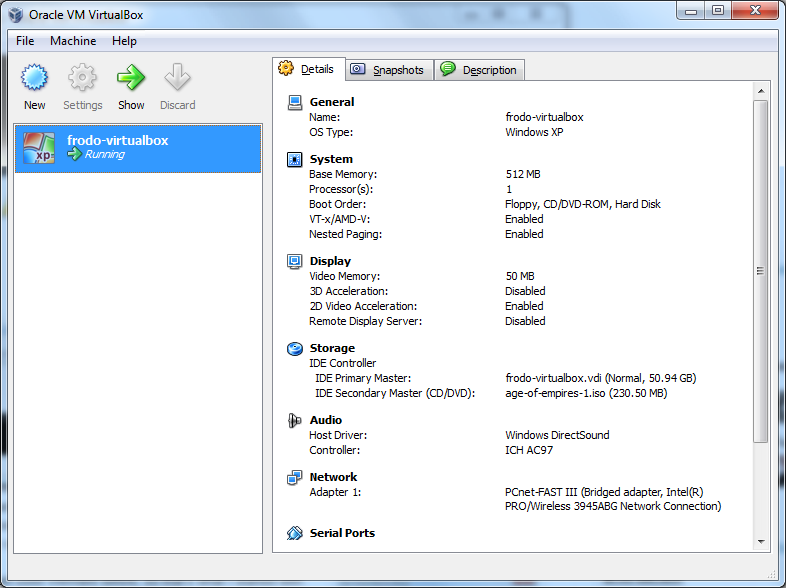 When you launch VirtualBox, you get a management window with your virtual machines in a column on the left, and configuration options on the right. From there, you can launch them in a separate window. 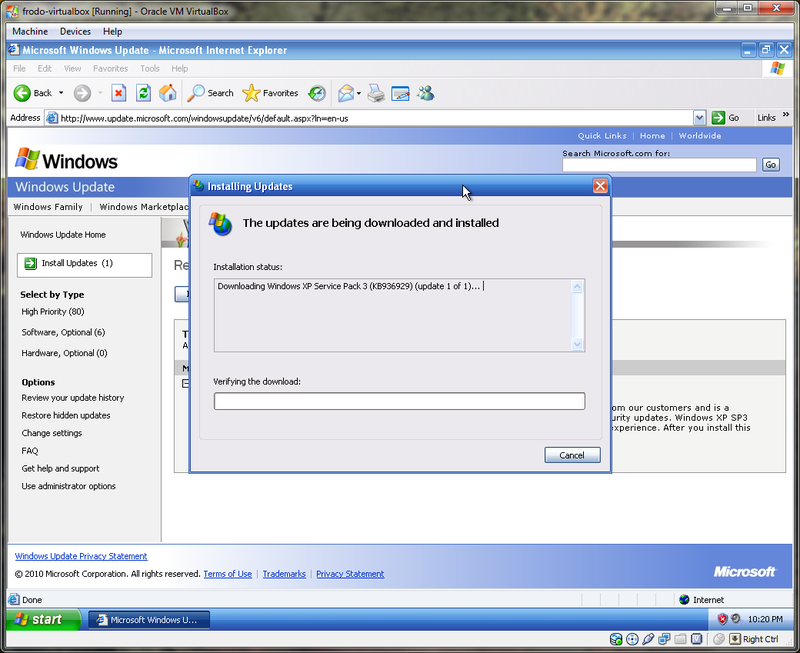 The integration tools install in the same manner as the other two (virtual CD-ROM with auto-run installer). One problem I ran into was that at first I couldn't take screenshots of just the VirtualBox VM window using Alt+Print Screen. This is because the VM was capturing my keystrokes when the window was selected. 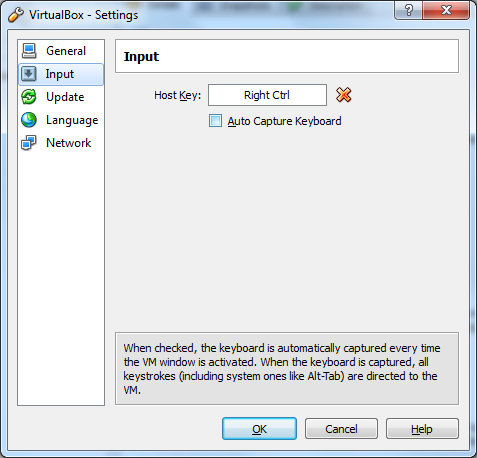 To fix this, I needed to disable the "Auto Capture Keyboard" setting under File -> Preferences | Input. 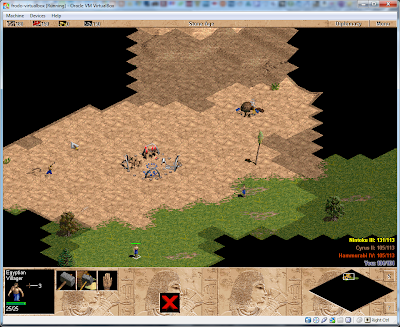 Once that was configured I was able to take screenshots without problem. Interaction isn't seamless with this setting, but I actually prefer this for my purpose, which is to run old games, because then there's no danger of scrolling off of the screen. I like the default escape key of right Ctrl, since it's easy to find with my finger whether my fingers are using the keyboard or the touchpad of my laptop. 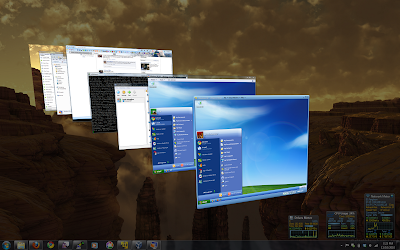 In order to get a cool screenshot, I attempted to load all three of the VMs: VirtualPC, VMWare, and VirtualBox. I was able to launch the first two, but then VirtualBox wouldn't load the VM because it couldn't get full control of the CPU the way it wanted, and my PC slowed to a crawl. I think this was because of the amount of RAM I had allocated to the clients, but also running two different kinds of VM is probably a bad idea. I know I can run two VMWare VMs without problem, so I think it's just the host programs that conflict, and not the fact that there was more than one of them. Anyway, I think VirtualBox is an excellent choice. Mouse performance was just as good as VirtualPC, and since it's an open source product, they have no reason to hold back full features like snapshots that aren't supported anymore in VirtualPC and that VMWare reserves for its Workstation product. 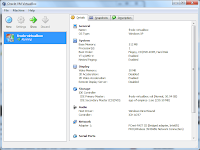 Because of these extra features, I would recommend VirtualBox over VirtualPC and VMWare Player.